UW Professor and Burke Curator, Greg Wilson, will share news about the ongoing Hell Creek work in Montana. 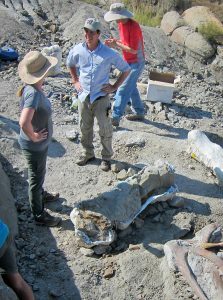 Greg is responsible for organizing the digging efforts that have brought fantastic dinosaur bones to the Burke, including Clarissa the hadrosaur and the Tufts-Love T. rex. Find out what has been accomplished and what is planned for this summer’s expedition. We will meet at the Burke Museum, downstairs in the old cafe, now called the Boiserie.